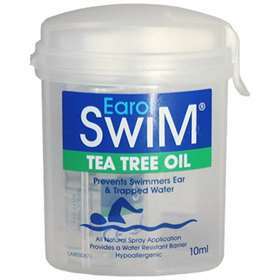 Earol Swim Tea Tree Oil 10ml has been created to prevent swimmers ear and trapped water. It is made with natural Tea Tree Oil and Olive Oil that works by finely coating the auditory canal creating a water resistant barrier. Apply Earol to both ears before entering the water. Pull the upper ear or Pinna upwards and backwards. Holding the bottle in an upright position with the nozzle placed into the ear canal press the actuator firmly. Earol is for single person only use. If you have or have had pre-existing outer ear conditions, it is recommended that you speak with your doctor prior to using this product. Do not spray near a naked flame, eyes or mouth. Ingredients: Natural Blend of Olive Oil, Mineral Oil and Tea Tree Oil (0.5%).